Searching for a Thanksgiving centerpiece today (among the glitzy baubles, snowmen, and reindeer) was like finding a needle in a haystack. But, it certainly helped us realize two things. First, don't wait until two days before Thanksgiving to buy a centerpiece (although it was on clearance!!) and second, we probably should start posting some winter things because Christmas will be here before we know it. So, for the last fall inspired board we have warm, bright orange paired with dark,cool navy. This look can actually work for fall nights or summer days as it can be warmed up for fall with soft candlelight for a cozy and romantic look or cooled down for summer with Khakis for that yacht club preppy feel. Maybe you're going for something modern and unexpected or maybe your just crazy for the Mets; either way this color combo is sure to be a home run! Wow! !An awesome dress....stylish footwear and elegant piece of ring.... !! 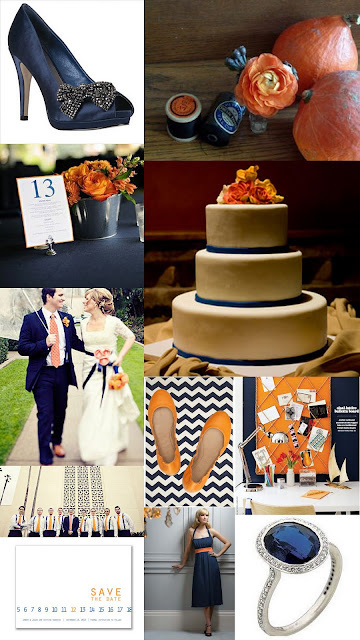 I don't normally like orange but I LOVE this color board!